Glasgow has been named as the host city of the 2018 European Championships. 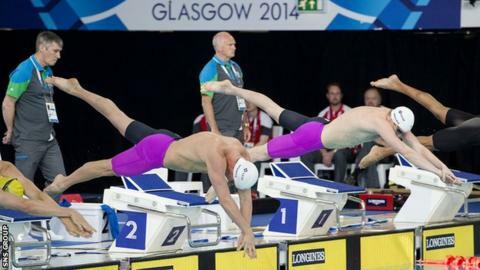 It will be the first time Scotland has staged the championships, which include swimming, diving, synchronised swimming and open-water competitions. And the success of this year's Commonwealth Games was a major factor in Glasgow's successful bid. "Organising that event at such a high level is a kind of guarantee for us for 2018," said European Aquatics Federation president Paolo Barelli. "Everyone had the chance to watch the outstanding success of the Commonwealth Games." Berlin is currently hosting the 32nd European Championships, while London will stage the 2016 event. Scottish Government Cabinet Secretary for Sport Shona Robison said: "This is a hugely important event, which will give us the opportunity to further the profile of swimming in Scotland. "Scotland is the perfect stage for events and we have already demonstrated that we have the world-class professional facilities needed for an event such as this with the Tollcross International Swimming Centre, Strathclyde Country Park and Edinburgh's Royal Commonwealth Pool as part of the Commonwealth Games." The dates and venues for the Glasgow 2018 event have yet to be announced.